I have to admit that’s a pretty smart marketing move over on the French front! 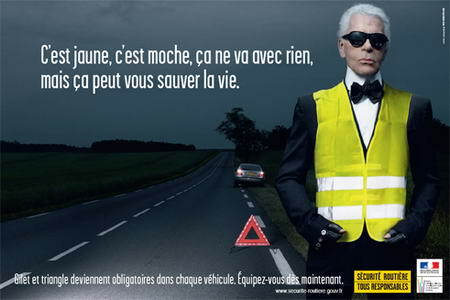 Karl Lagerfeld promotes the light-reflecting safety vest (part of a regulation that becomes active October 1st and if you choose to not respect it, you’re good to pay $210). C’est jaune, c’est moche, ça ne va avec rien, mais ça peut vous sauver la vie./It’s yellow, it’s ugly, it doesn’t go with anything, but it could save your life. Its not that bad and necessary alas. And as a bonus we do know now that even Karl admits that we are mortals.